For many years I lived in Vancouver, B. C., which is considered one of the top 3 ‘most livable’ cities in the world. One of its best features is being surrounded by water on three sides. On one occasion I was painting a view from Locarno, one of the many beaches, and was suddenly overcome by a summer storm. It seemed to descend out of nowhere. As I was not going to escape getting soaked, I soldiered-on and managed to get as much as I could onto paper without the deluge completely washing away everything while working. Fortunately I had some sort of makeshift shelter–even so, rain splattered onto the painting as I worked. Painting on location has its rewards as well as its hazards. In those years, I wouldn’t paint at all unless it was outdoors. 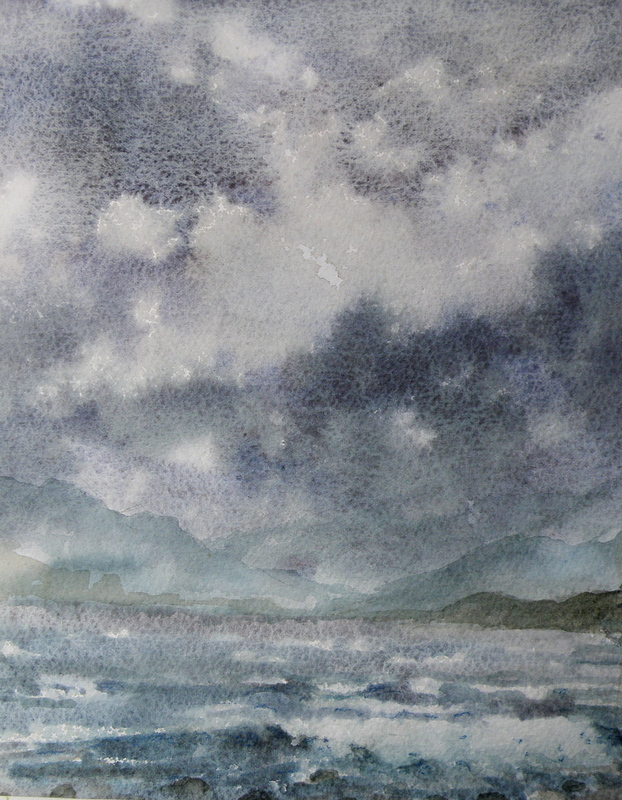 I was something of a purist, and felt watercolour was meant to be done on location–its immediacy and qualities almost demand it being put to use that way. But bad knees are what they are, and now I almost can’t imagine having to go do that again–which is really a shame. Working from photographs is not my idea of what watercolour should be about. 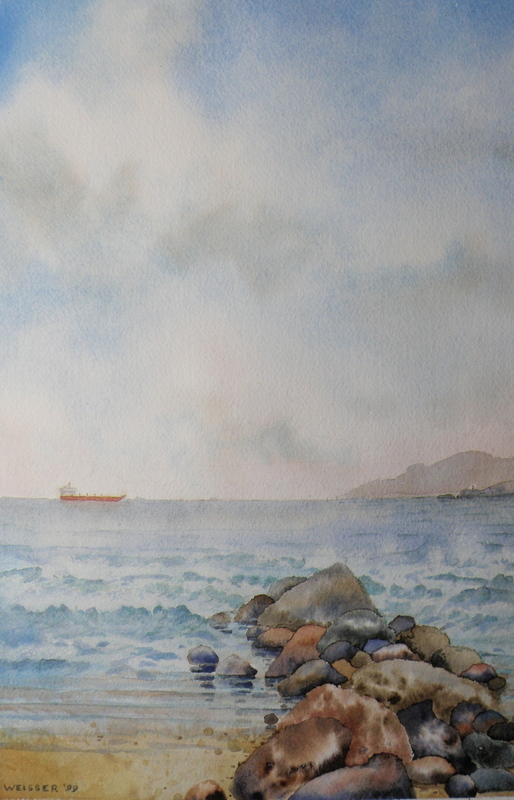 The depicting of waves in watercolour is particularly challenging when one has decided on being a ‘purist’ by refraining from both opaque white and masking fluid. Personally speaking, masking fluid has become so offensive in terms of smell (its natural thinner, in case anyone wonders, is ammonia, which is why it smells so awful–but a little ammonia will indeed thin thickened masking fluid, if stirred in slowly), and damaging brushes (even when dipping them in soapy water first), and causing the hardest of edges when removed, that it’s rarely a choice for me. It does make for quite lovely snow squalls when flicked from a stiff toothbrush, I must say–and great fun, too. Breaking waves challenge any student of watercolour (and every single person working in this medium will forever be a student) because of having to leave paper white for crest foam, swash, and the receding backwash effects. This, coupled with understanding which part of the wave receives more or less pigment, not to mention the change of pigmentation if backwash is curling up and drawing in sand at the same time, comes the added realisation that sky is being reflected off top surfaces the further from shore one looks. There truly is nothing for it but to get right into the actual physics of spilling, surging, plunging, and collapsing breakers, each of which exhibits its own characteristic properties–ones our eyes are very accustomed to and therefore recognize in a flash when viewing surf–properties a viewer expects to be reproduced in paintings (if the painting is trying to conform to the challenges of representational art, that is). https://en.wikipedia.org/wiki/Breaking_wave Drawing each of these examples over and over again makes wave action less of a mystery and eventually becomes familiar and far less challenging. However, a single line of waves is always backed by more, multiplying the visual dynamics, adding to the confusion of having to depict row upon row of breakers. Where does foam end and the gathering wave behind it start? For this, it is very instructive to carefully observe photographs and again draw over and over how this actually does look. (https://en.wikipedia.org/wiki/Breaking_wave) Only then, personally speaking, do I find painting on location not as daunting, for stopped action is easier to analyze than sitting in front of actual pounding surf. Painting water is a dedicated pursuit all of its own. There is a painting friend of mine who includes water in every single piece he does because he is dedicated to the depiction of water, whether in the form of rain, surf, river, lake, stream, waterfall, because in each case there is a lifetime’s worth of challenge. CAMPING ALONE along the Oregon Coast–that fantastically alive strip of ocean wonders–provided many outdoor painting pickles. . . .
PICKLE #2–the wind. Big, dramatic, vividly-alive ocean waves are that size because of the wind. The wind along the Oregon Coast is permanent and robust. It carries away notebooks, sketch pads, laptop easels, flimsy plastic pallets, kolinsky brushes, art pencils, and tissues. And, as one panics, dashing after them, fresh water rinse containers are spilled (of course, the nearest fresh water source is at the damn parking lot bathroom), and then (naturally) there goes the lawn chair, too–end over end, heading towards the box kite-flying couple smirking at the Mr. Bean imitation. Everything rescued, finally sitting, easel anchored with one determined hand, brush swishing about in the water jar, a sudden gust throws sand over everything, and the stupid tilley hat Christmas present (guaranteed to age a person 20 yrs, whether 25 or 55) is seen sailing out towards the surf, the wind carrying away the muttered sounds of ‘good riddance’ along with it. PICKLE #3…..time and tides. Outdoor painting (forget this en plein air crap–it’s called painting outdoors) isn’t done in studio time. It’s done in real live time. The tides never stay put. So the grand, thundering waves are either constantly retreating as the scene is being depicted, or–this is nabob of stubbornness–they are approaching at an erratic, yet ever-constant rate, until the-I’m-staying-put painter sees his supplies (pallet, paint box, little stool, brushes, tubes, you name it) suddenly sucked out into the collapsing surf of an unannounced, really big wave–a REALLY BIG WAVE–which is about to be followed by another. 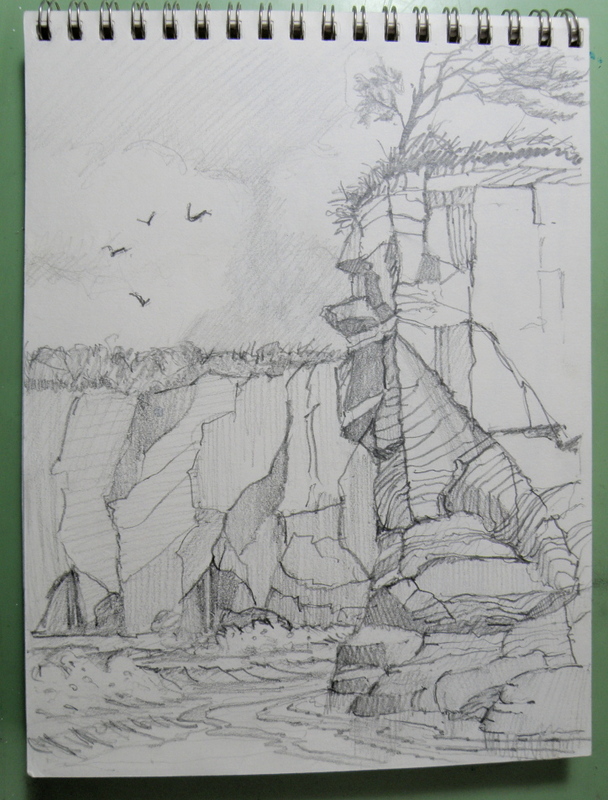 ….. and sketching is suddenly the preferred medium…. *sigh*… and geriatric Charlie Brown decides to go find some fish and chips–and a local art supply store. …..and maybe a therapist. or a bar. Ten percent larger than New York’s Central Park, is Vancouver’s Stanley Park–1001 acres of enormous cedars, Totems, hidden pathways, creeks, ponds, ocean views, as well an amphitheatre and The Vancouver Aquarium. It was named after Lord Stanley, the Governor General of Canada in 1888 (and also the person who donated the famous Stanley Cup for the emerging hockey teams of the day to compete for). Lord Stanley became the first Governor General to visit British Columbia when the Park was being dedicated. This painting was done on location within the Park while sitting on one of the many available sand-encased logs. 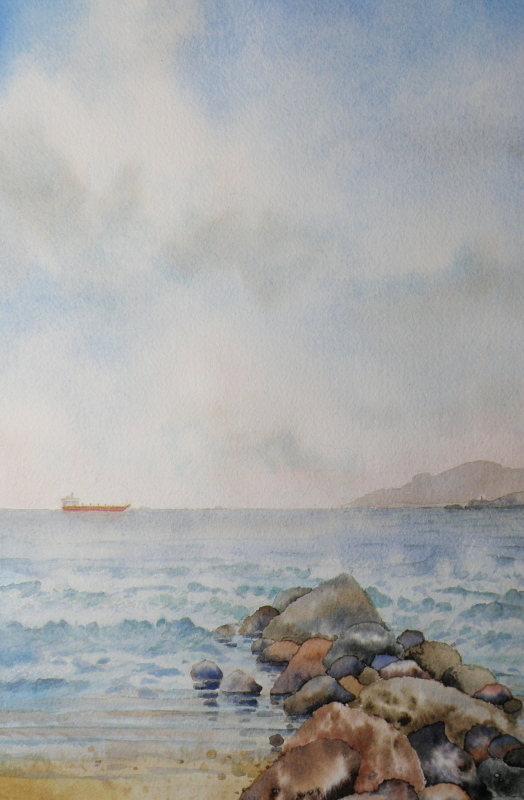 The spot is known simply as Third Beach, and looks out towards a very distant (not always visible–and not in this painting) Vancouver Island. It took most of the day, and while there a baby seal washed up on shore. Being tied down to all my spread-out gear, I called out to those closest. Mobile phones weren’t as prevalent then as now, and it took the gathering crowd quite a while before attendants from The Vancouver Aquarium came to rescue the little guy. They have an adoption program which results in a release later on after the animals have matured.